The Board also included 7 ex officio Guardians, making a total of 29. The Guardians met each week on Thursday. The population falling within the Union at the 1831 census had been 66,858 with divisions ranging in size from Drumreilly (population 2,954) to Mohill itself (7,672). The new workhouse, built in 1840-42, occupied a 6-acre site on the west side of Hyde Street at the south of Mohill. It was designed to accommodate 700 inmates. Its construction cost £6,700 plus £1,280 for fixtures and fittings etc. It was declared fit for the admission of paupers on 25th April 1842 and admitted its first inmates six weeks later on 8th June. The site location and layout are shown on the 1912 OS map below. The buildings broadly followed Wilkinson's standard layout although on the basis of the 1912 map appear to have lacked the usual separate entrance block. The porter's room and Guardians' board room were presumably incorporated into the main accommodation block which would also have had the Master's quarters at the centre, and male and female wings to each side. At the rear, a range of single-storey utility rooms such as bakehouse and washhouse connected through to the infirmary and idiots' wards via a central spine containing the chapel and dining-hall. 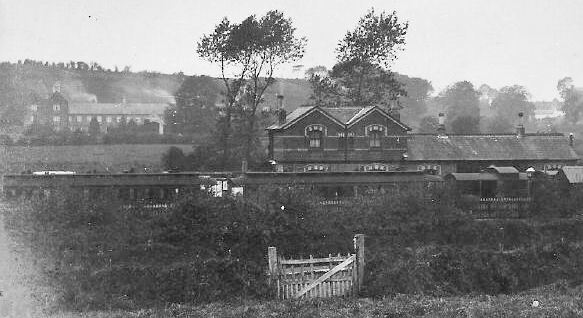 Mohill workhouse (left) from the railway station, c.1900. During the famine in the mid-1840s, a fever hospital was erected at the south of the workhouse. A dispensary was located near to the road at the north. At the 1901 census, the population of the Union was 19,854. The former Mohill workhouse has now been demolished. Mohill Union: Minute books (1839-1922, some gaps); Rough minute books (1843-64, some gaps); Accounts (1842-97, some gaps). Rowan (Fenagh) Dispensary District: Minute book of Management Committee (1852-94).